Yikes, today is going to be HOT! We are about to head out for our walk and I am thinking about taking the kids to the water park for a few hours this morning. Hopefully everyone will follow the rules of proper swim wear today (ex. no white clothing and preferably lined) so my kids and I don't have to see strangers' naughty body parts! But first...I have kind of been on a strange food kick around here, lately. I am craving things that are kind of odd combinations and looking for quick ways to make things without turning on the oven. I have also fallen way behind on posting food stuff. I just went through my photos and there are quite a few things that I need to share! Instead of starting with the older stuff, I will get to what we had last night. Last night the boys wanted stir fry. I am always happy to do that since it is a great way to get some veggies in them. Jay was not as happy with the abundance of veggies and I cooked it a little longer in hopes that it would appeal to him more (or that he would not be able to identify them). Um, no, he asked that I go back to peppers and onions next time. Fair enough, I take that as constructive criticism (or personal preference). At least he will eat that. He will even go for carrots and peas if they are small, so we will try that next time. In his defense, I did put every vegetable in the house in this. Since I can't eat this due to the soy, I will trust the guys that the sauce was good. It is similar to mongolian beef, so it is a little on the sweet side. It smelled incredible! Now, for what I had! I decided to do a little stir fry of cabbage, zucchini, onions, garlic and ginger. 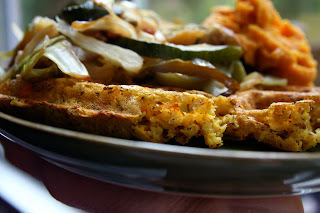 I have discovered a love for savory waffles lately due to this creative individual. After the slider on an oatmeal flax waffle, my brain has been spinning with ideas! I had some roasted carrot hummus that I wanted to use in some way with it, so I mixed some of that in the batter. The first two were casualties. I thought I was going to have to throw this out the window (figuratively-you know I don't throw anything away). I scraped them off the waffle iron and decided maybe a little spray would help. I did this, closed it down and then the boys came over sniffing at the crumbled up waffles. I thought they would turn their noses up at them, but no...they devoured the broken up pieces! I am happy to say that the spray worked, so I got to enjoy these as I intended! I had them with my quickie stir fry and some extra roasted carrot hummus on the side. Loved the combination of this! The waffles crisped up nicely on the outside with a nice chewy soft inside! Mix the oats through water and allow to sit for about 10 minutes. Next add the baking powder and cook according to your waffle makers directions. Any hummus would do here. I just used what I had. I love these! The boys had them as the bread for their ham, egg and cheese sandwiches today! Do you think outside the box with food and crave strange combinations? What have you tried lately and liked? Have fun at the water park! Perfect for the heatwave we've all been having! 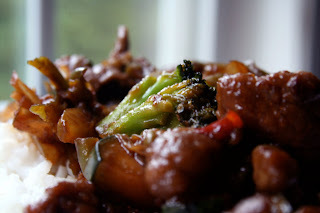 I love a good stir-fry -looks perfect! I looooove savory waffles!! Such a clever idea! The best part is that it's so fast and relatively easy clean up! Usually, the day before a grocery trip, I come up with some odd stuff. But why am I drawing a blank right now?!?!? Ahhh! I still find bacon on french toast weird! Interesting waffle combo. I think I may actually like savory waffles. May need to give that a try. I hear you on not wanting to turn on the oven! I love savory twists on sweet foods! The water park sounds pretty fantastic right about now! I am so glad to have found your blog! I can't eat dairy anymore and suspect more food allergies/intolerances too so will be reading your blog from now on for more exciting things to cook. :) Thanks! That is awesome that your boys ask for stir fry!! I hope my kid requests stuff like that!! :) And woah, those waffles look really good!! I've never had a savory waffle, but I would totally try that one out. So creative!! 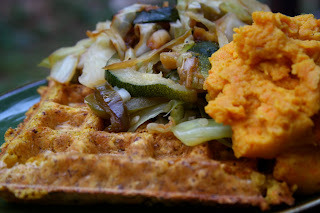 I have been so craving savory waffles. Tomorrow it is on. You have affirmed my craving aha. I always pair waffles with maple syrup and never go the savory route. I am obsessed with hummus so I know I'd love these. I don't think I'm that creative in the kitchen, not like you are! What an interesting and great idea for a waffle. prewritten post for tomorrow on strange combos..yes! Hummus in a waffle? You are too creative. Really! It looks fantastic. And I swear, my waffle iron is incredibly forgiving with some spray, too! lol. I think I just throw anything on it that is even remotely close to a waffle consistency, whether it has an egg and baking powder or not! Stir-fry staple recipes are essential, but the creativity of those waffles - you amaze me! love it.